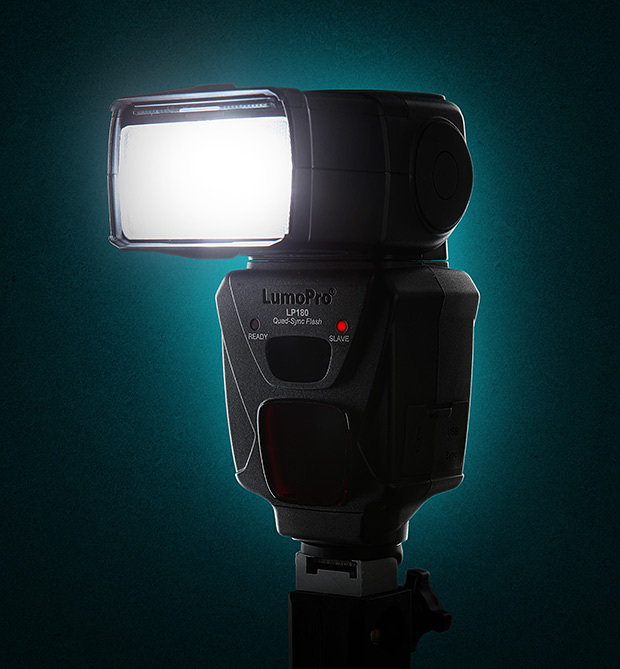 Yesterday LumoPro announced their new flagship flash, the LP180. If you aren’t familiar with LumoPro, a little history is in order. In 2009, LumoPro burst on the scene with the LP120, a light designed for photographers rediscovering the benefits of small flash. Many of us wanted simple, reliable speedlights to use on location, but we were unhappy with existing options. LumoPro flashes became standard equipment for many in the strobist community. For several years I’ve used LP160s, the second generation flash from LumoPro. I’ve recommended LumoPro flashes to countless photographers, so I was excited when Kevin Deskins at LumoPro invited me to play with an early version of the LP180 and give feedback on the new design. When I unboxed the flash I was a bit surprised by its heft compared to my other speedlights. I wondered if it would feel bulky in everyday usage, but it didn’t take any time for it to feel normal. My second impression was that LumoPro has really stepped up their manufacturing game. The look and feel of the flash are first-rate. The mechanics are great. The tilt and rotation are smooth and solid. Battery indicator. Why don’t my Canon speedlights have this? Now I don’t have to guess at battery power by gauging the refresh speed of the flash. The ability to add a high-voltage power pack. If I could have added one feature to the LP160, it would have been a port for a high-voltage power pack. When I’m on location, refresh times are my biggest enemy. Finer control of light output. Flash power can be adjusted in 1/3-stop increments down to 1/128 power. Expanded slave compatibility. The LP180 will accommodate flashes with any number of preflashes (well, up to 10–that should be plenty). This is surprisingly useful. Gel Slot. The new gel slot on the front of the flash makes it that much easier to use gels with modifiers. In addition to these improvements, the LP180 carries forward the core features that endeared its predecessors to so many of us. These flashes do one thing, and they do it well. I’m not looking for TTL or anything fancy here. I want a reliable, manual flash. With the LP180, LumoPro has delivered again. 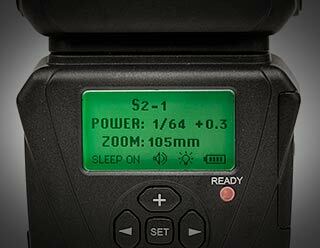 It’s a simple, affordable off-camera flash and it’s backed by LumoPro’s reputation and 2-year warranty. The LP180 can be triggered four different ways: PC port, hot shoe, 3.5mm (1/8″) miniphone port, or the wonderfully sensitive built-in optical slave. No proprietary connections or expensive cables here. The LP180 comes with a 3.5mm cable (a standard “headphone” style cable) that will allow you to easily and securely connect the flash to your wireless trigger. If you’ve been using the LP160, the move to an LCD display on the LP180 is a slight adjustment. There are tradeoffs with an LCD display, but I think that on net the new display is a step forward. The biggest and most obvious advantage is that the LP160 allows more precise control of the light. Also, the new display can easily be read in full sun or total darkness. The disadvantage is that the viewing angle of any LCD display is not going to be as wide as the lights on the LP160 (assuming you were inside where you could see them). So, I found that when I had the 160 up on a taller light stand I couldn’t always check the power and zoom settings without moving the flash to get a better look at it. Sync: 3.5mm (1/8”) Miniphone port, PC port, standard ISO hot shoe, and built-in optical slave. Built-in Slave Function: S0 (off), S1 (standard optical slave), and S2-1 through S2-10 (preflash synchronization slave). Sleep Mode/Auto Power-off: Sleep mode engages after 20 minutes (if enabled). Auto power-off engages 3 hours after sleep mode. Accessories: Soft case, flash stand, 3.5mm miniphone to 3.5mm miniphone sync cord, pre-cut Rosco gel set . The LumoPro LP180 is inexpensive enough ($199) to make it a great flash for someone just getting into off-camera lighting, but it’s well enough built for any professional to trust it on location. It’s impressive how far LumoPro has come in such a relatively short time. In the US the LP180 is available from MPEX.com. Great review. I’ll probably buy this instead of another Canon Speedlite since the Canon optical slave system I’m stuck with is so temperamental and to buy all new Canon Speedlites would be prohibitively expensive.